Sounds interesting. I’d imagine he’d be similar in stats to a warrior/gladiator. Maybe if it could be managed, to have his critical be a tail whip attack. And since there are only two force members in the whole game that can wield axes, seems like the logical choice. IMO a Lizardman's Attack should pack a punch, if not top tier then solid at least. The Lizardman enemy in SF1 has the "Critical Hit" special attack, so the critical rate should be good as well. They also have a pretty long shlong HP bar relative to their level, at the cost of a mediocre Defense. Maybe you could slap a slight weakness to ice on top to mitigate his spell tanking ability. Finally, you could give him just enough AGI so that he gets his turn before the warriors on average, all in all making him more suitable as an attacker rather than a tank. Update is a little late my apologies i was knee deep in work. Today's update will be talking about a weapon rarity system on top of longer and tougher battle as well as the loosely covering the new heroes that will be joining you on this adventure. the concept is simple very powerful and unique weapons that can be obtained by meeting certain requirements and defeating special enemies. Legandary: Mostly story driven or boss drops these weapons give a good boost to a specific stat nothing more they can easily give you an edge for awhile. Seven Moons (Sword): Grants 30 Atk Use ability: a special version of heal that can only be used on the user. If its anything about shining force 1 that irritated me is the fact that the battles were too easy/too short we are fighting an army right? It always bugged me that Runefaust version of an army was 10 guys lol. I am well aware of the limitations of both the game and the editor so it will be tricky to remedy this but my idea is to add more enemies that will appear like reinforcements as the battle progresses enemies will also be tougher you will need to use everything at your disposal in order to win. There will also be Mini boss like enemies that drop alot good gear for your team. I do plan on double updating today so expect more beans to be spilled later today. This all sounds awesome! And I'm digging the new title! Might be of some use to you, as I personally have a lot of trouble figuring out suitable stats for characters. 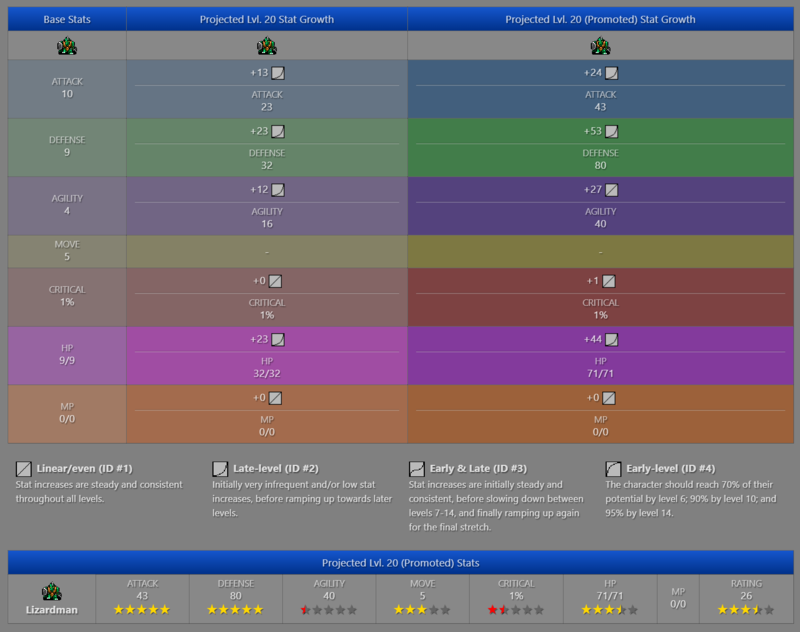 The projected level 20 promoted stats also take into account the penalty applied to stats after promotion. Interesting stuff Steve! Brutus has been a hard nut to crack this helps a ton Merci! I cannot wait to play this. wowza its been awhile since i updated this! Work on MOTO is moving slow due to still learning the editor and work. However i have not given up! I try to squeeze in a good few hours before work to set up everything. The story as of now is about around chapter 7 in terms of writing and game wise chapter 1 is still being worked on this is due to alot of experimenting in order to spice the game up so it truly feels different from logi. Any questions you guys have i would love to hear them merci!!! Glad to hear that you haven't given up. It takes some endurance to bring a project like this to completion, so good job getting this far. Keep in mind that ROM hacking is not a sprint, but a marathon so keep running and bon courage ! Im back (again XD) with another wonderful little update on whats been going on with MOTO this week i have been testing some map ideas for the first 3 battle taking a little inspiration from Tyadran's Cendiel hack. Also a good chunk of my time working on Moto i have been converting the script i wrote into the actual game via dialogue. All this time and ive still only scracted the surface i love me a good challenge. Im not sure if i will have much to update on moto next week because Christmas season is coming in quick so im trying to wrap up as much as i can this week.